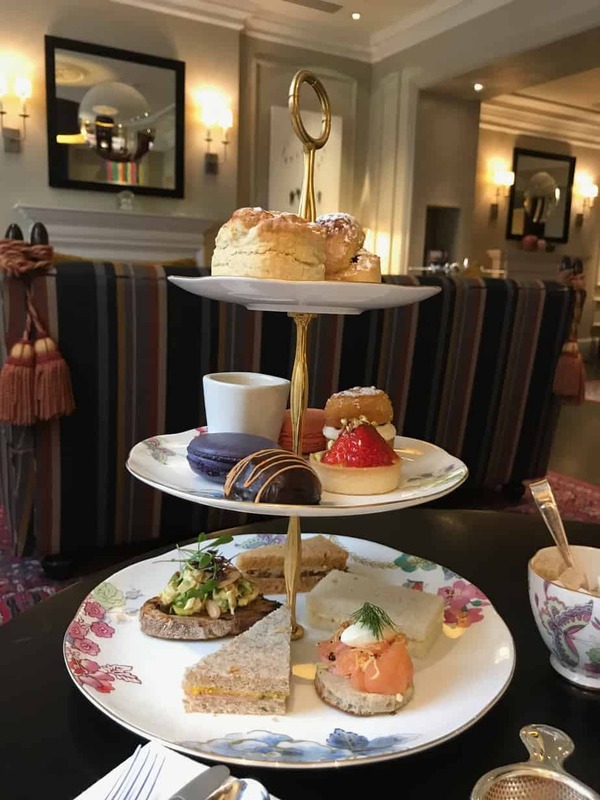 According to some sources, the tradition of Afternoon Tea started in London in the early 1840s. It is often attributed to Anna, the 7th Duchess of Bedford who requested a pot of tea and snack in her private quarters to get her though the long wait between breakfast and a late dinner. Lunch was not commonly eaten among aristocrats at the time. Once Anna started inviting others to join her, the custom of Afternoon Tea spread among the higher classes. 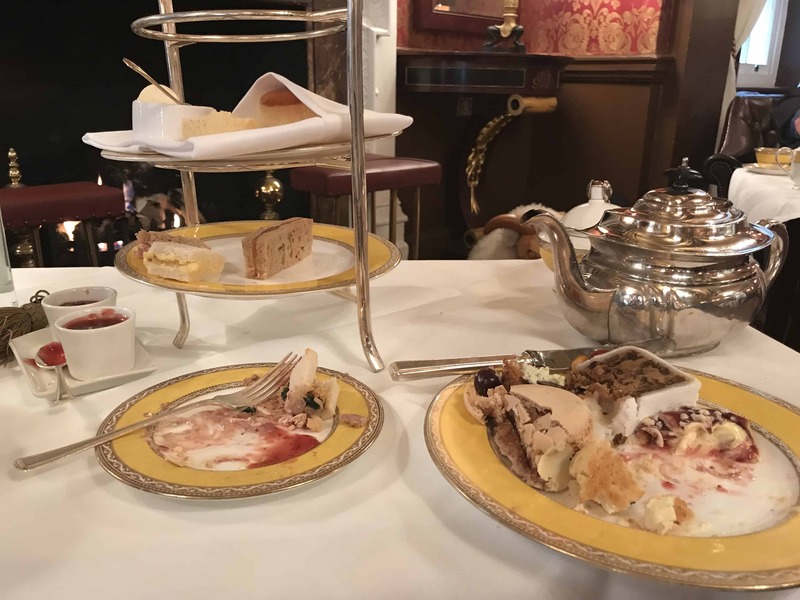 The middle and lower classes drank tea with a more substantial meal in the early evening and did not have the large late dinner consumed by the upper classes. This more robust tea, served at traditional tables of higher height than the tea or coffee tables used for afternoon tea, became what is now commonly referred to as “high” tea. I have read another account of afternoon tea being served by the Duchess of Lauderdale in London as early as 1610. 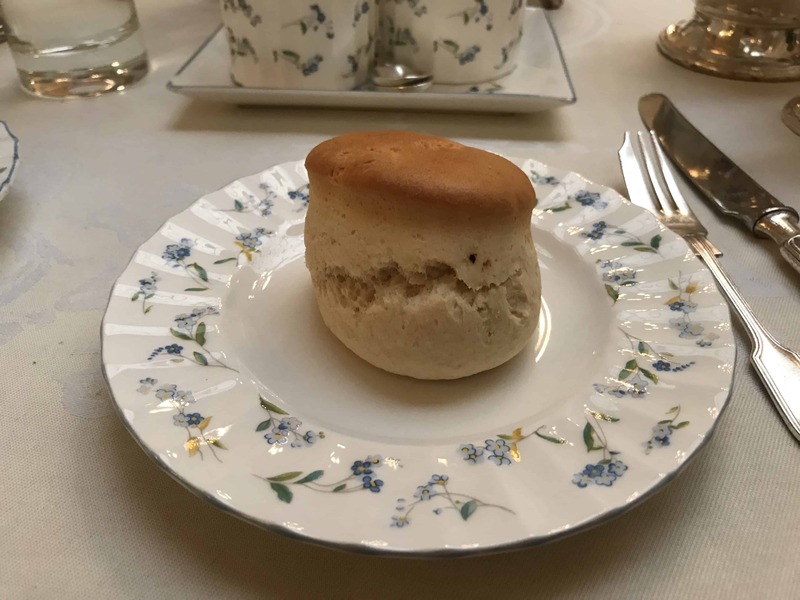 Whoever started the tradition, by the early 20th century scones had been added to the menu and Afternoon Tea had become firmly entrenched as a part of English Culture. 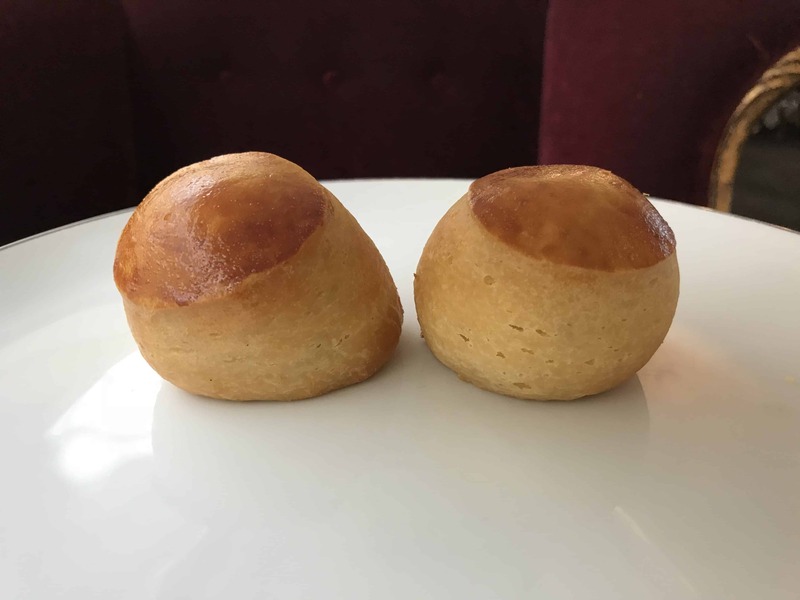 • Scones with clotted cream and jam, sometimes served at the same time as the above and sometimes baked fresh and presented upon guests’ request. 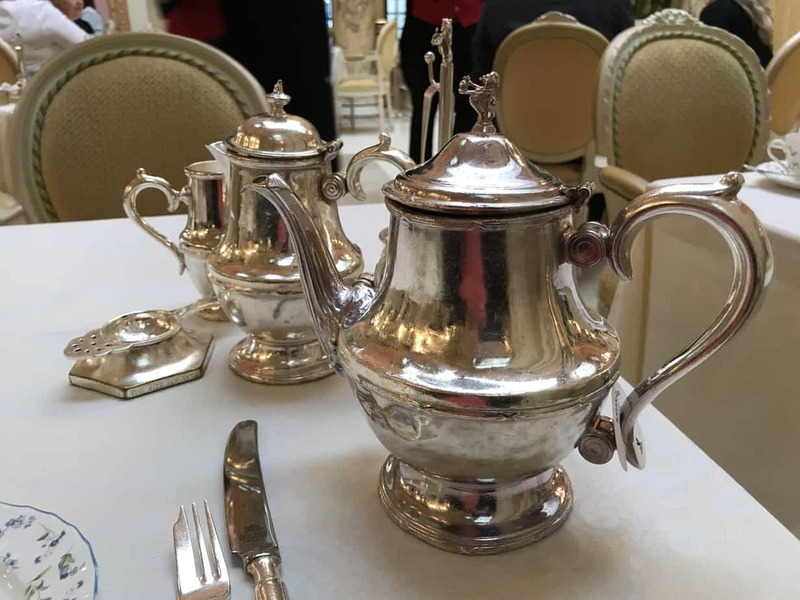 The three courses, even if the scones are served later in the tea service, are usually presented on a 3-tiered plate stand of silver and china. 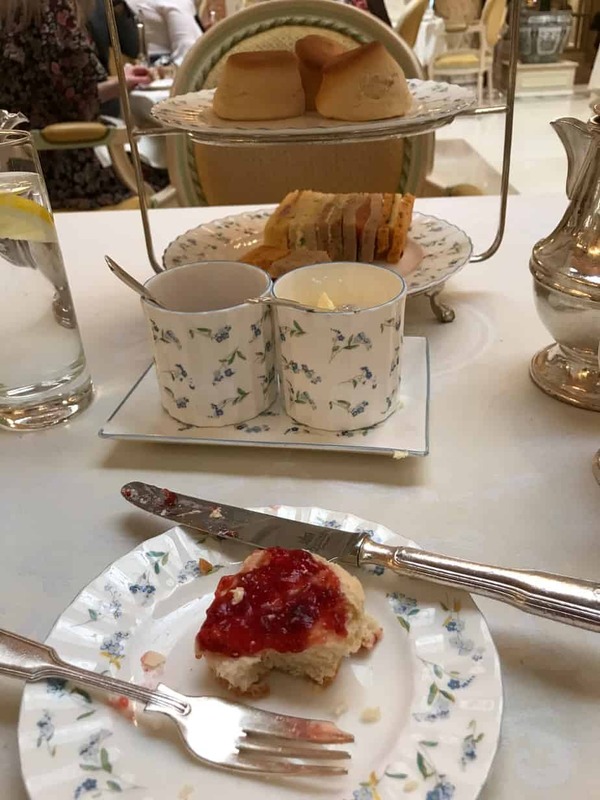 In today’s busy world Afternoon Tea is more often consumed as part of an afternoon outing than a daily in-home occurrence. 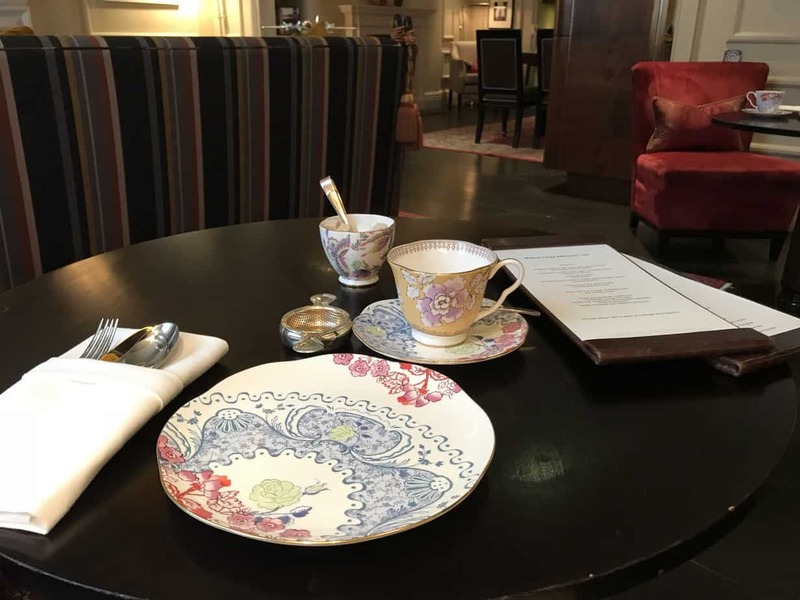 On my last stay in London I decided to live out a long-held fantasy, Afternoon Tea each day of my stay, experiencing a new location each day. The fantasy lived up to my expectations. A warning for those of you seeking a similar experience. 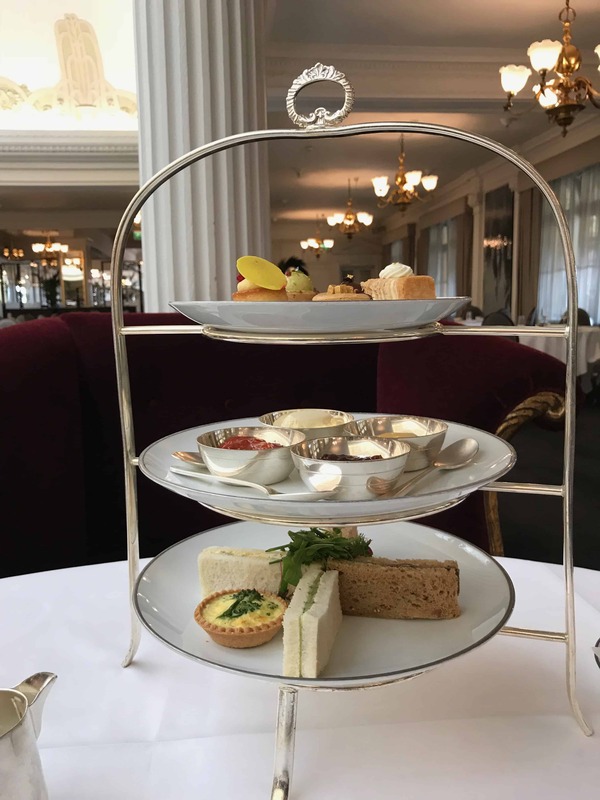 In spite of making Afternoon Tea my only meal of the day, with a piece of fruit and tea in the mornings and water and a very small snack in the evenings, I realized at the end of day one that five days of consuming Afternoon Tea presented an unexpected challenge. The amount of food served at each tea is more than I usually eat in an entire day. And, servers kept asking if I wanted my trays refilled, or would like another of something I particularly liked! No matter how tempting the selection, I never managed to consume an entire serving of savories, sweets and scones. 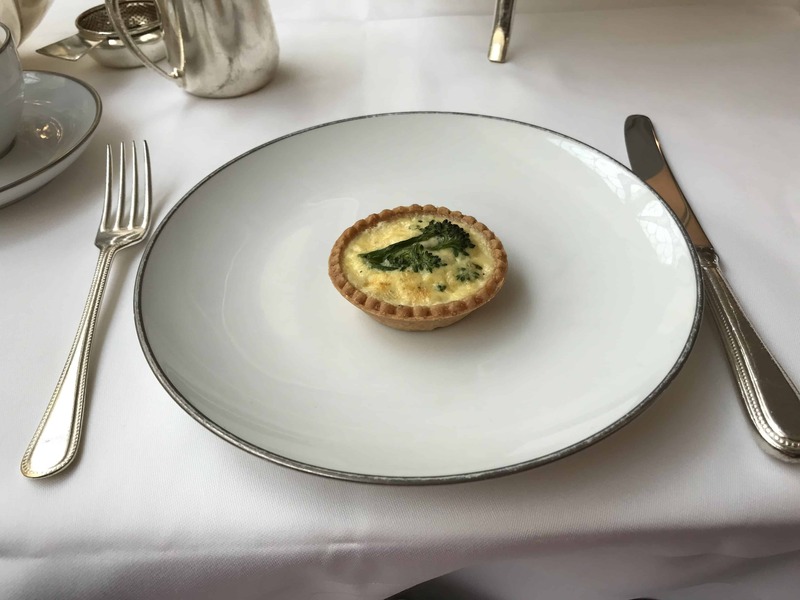 I only had a second of one item, a petite quiche at Harrods Georgian Room during my fourth Afternoon Tea. Although quite tasty, I mainly indulged in a second serving because it was a break from sandwiches, sweets and scones. I left unfinished platters at all five teas, lovely treats that I knew I would regret leaving behind, but that I simply could not make room for at the moment. 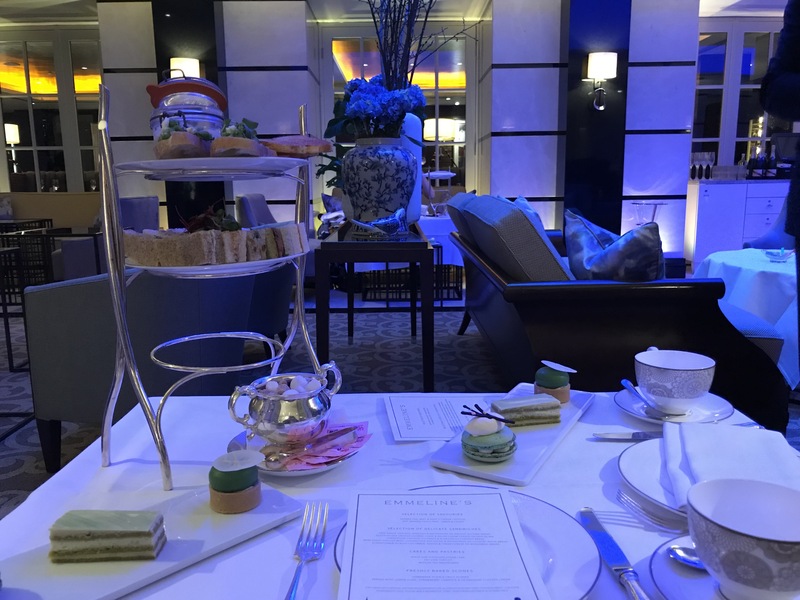 My five days of teas started with a Mother’s Day Tea at The Arch London. One of my favorite London hotels, the stately elegance of The Arch epitomizes London. 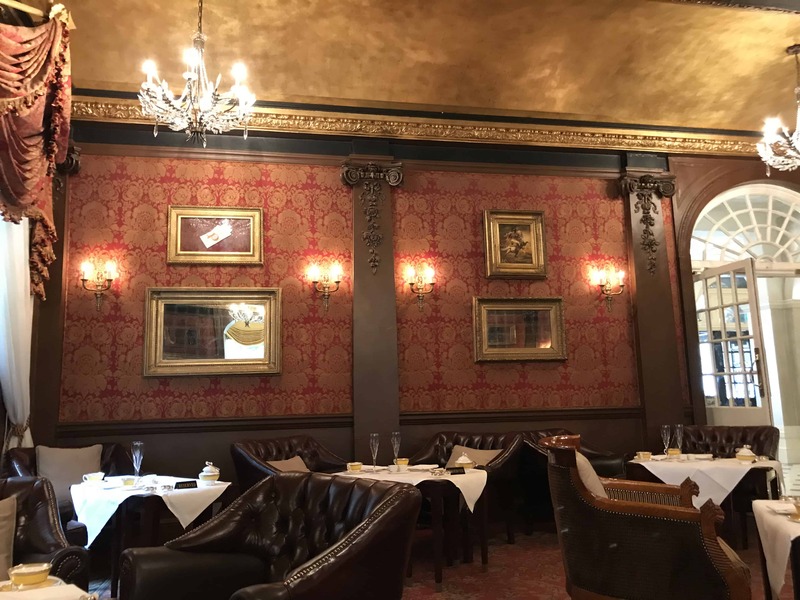 Its location just a few blocks from The Marble Arch Underground Station and the entrance to Hyde Park makes it a great location for locals and travelers. 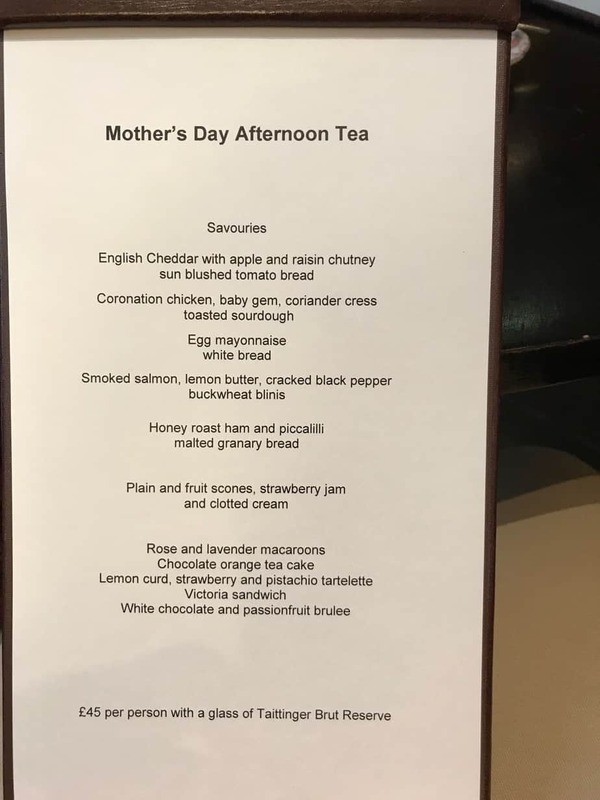 On Mother’s Day afternoon tea was served in The Martini Library as well as Hunter 486, The Arch’s excellent restaurant. Service started with my choice of teas from an extensive selection and the presentation of Afternoon Tea menu for the day. 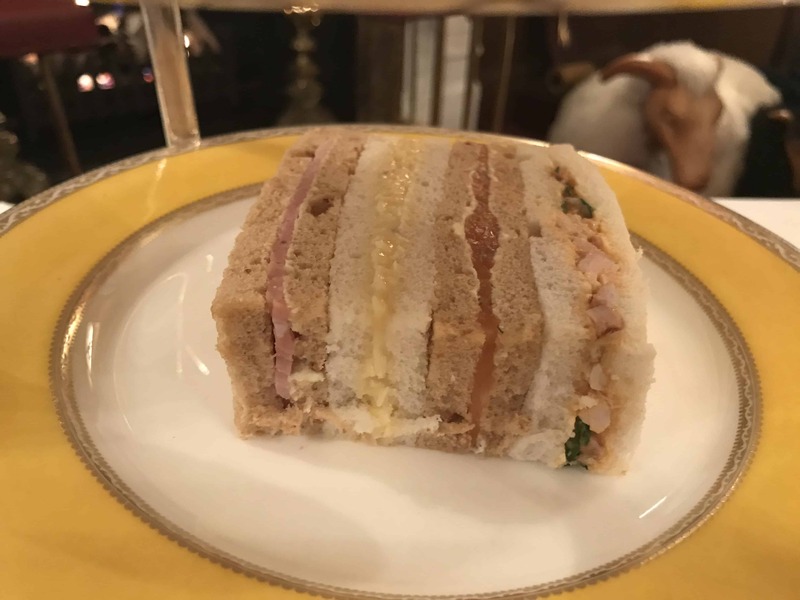 • And, my personal favorite – Honey roast ham and piccalilli on malted granary bread. Next came my freshly baked scones along with strawberry jam and clotted cream. 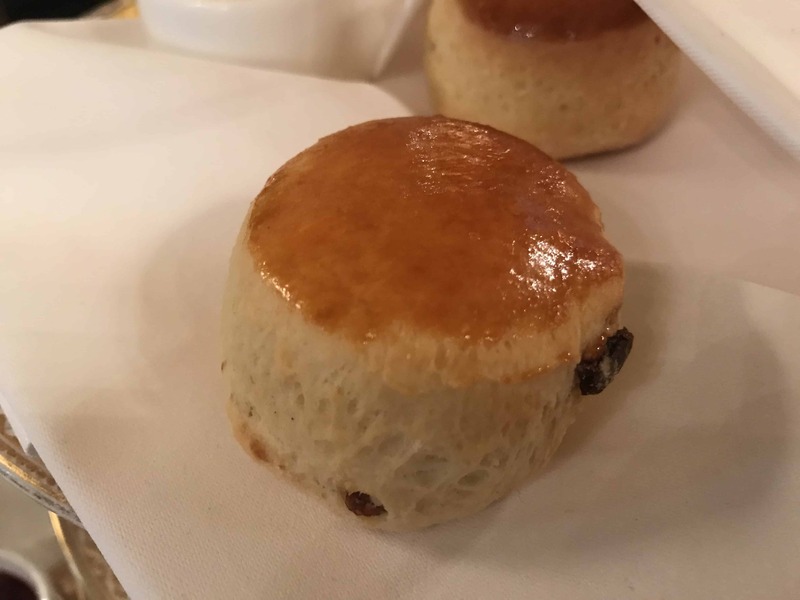 Before adding cream and jam with my scones I asked my server the all-important question, what did she think was the appropriate way to prepare a scone, jam first or clotted cream first. Her politically correct answer was it depended on where you were from, each region in the UK has their own preference. So, I tried it the way it is served in her region which is jam first. 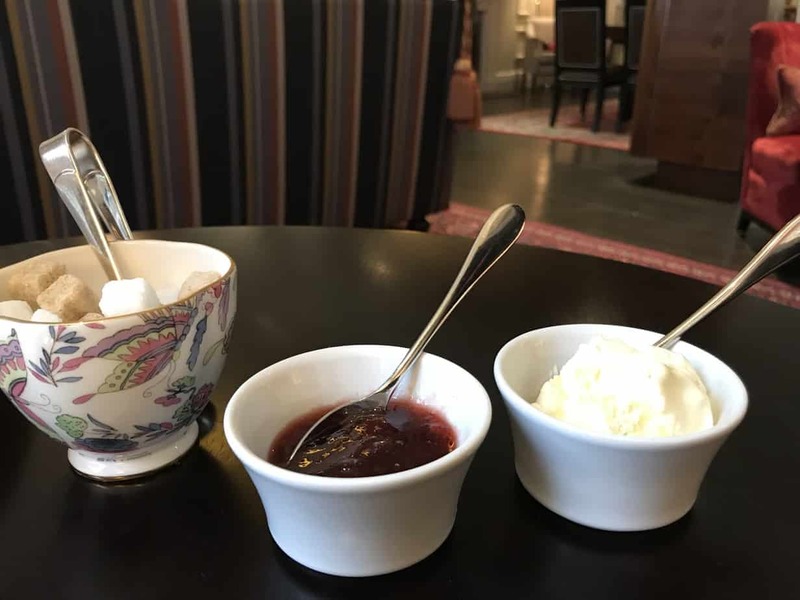 Here is my personal decision on the order of jam and clotted cream after trying it clotted cream first the next day. It is based on practicality. When I served the jam first I found it difficult to really spread the cream on top. Starting with the clotted cream and giving it a good spread atop the scone I found the jam topping easy to add. After trying it both ways again throughout my five days I am now firmly in the clotted cream, then jam camp! 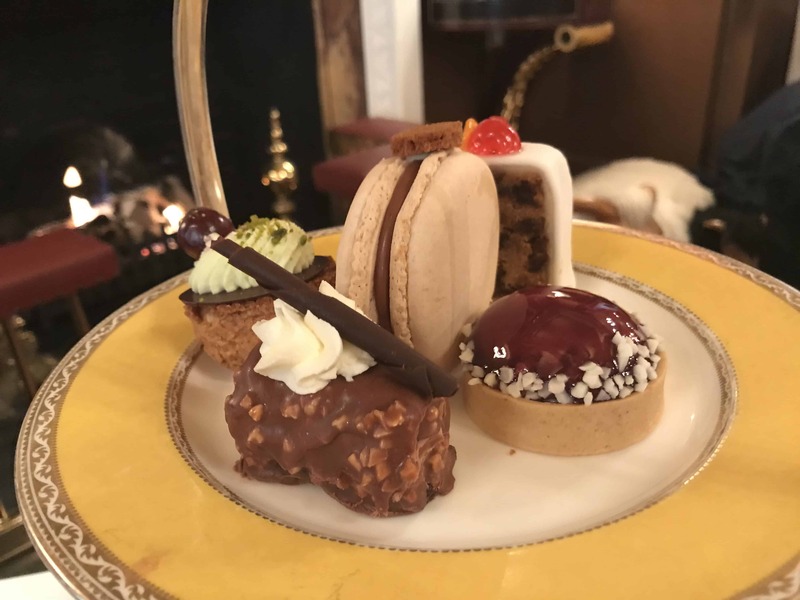 Royal Afternoon Tea at The Arch, is currently priced at £28.00 per person or £39.00 with a glass of Tattinger Brut Reserve. Afternoon tea is available from 12pm until 7pm. You can choose to be served in the Martini Library, Hunter 486 restaurant or Salon de Champagne lounge. Their menu changes with the season and can be found online. 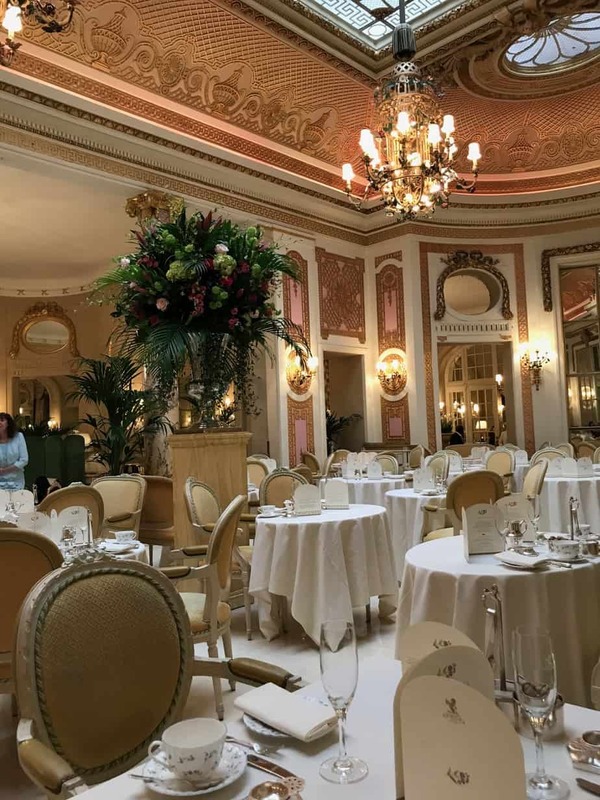 Afternoon tea has been served at The Ritz London since it opened its doors in 1906. Mention the words tea and London together and The Ritz is what pops into most people’s minds. 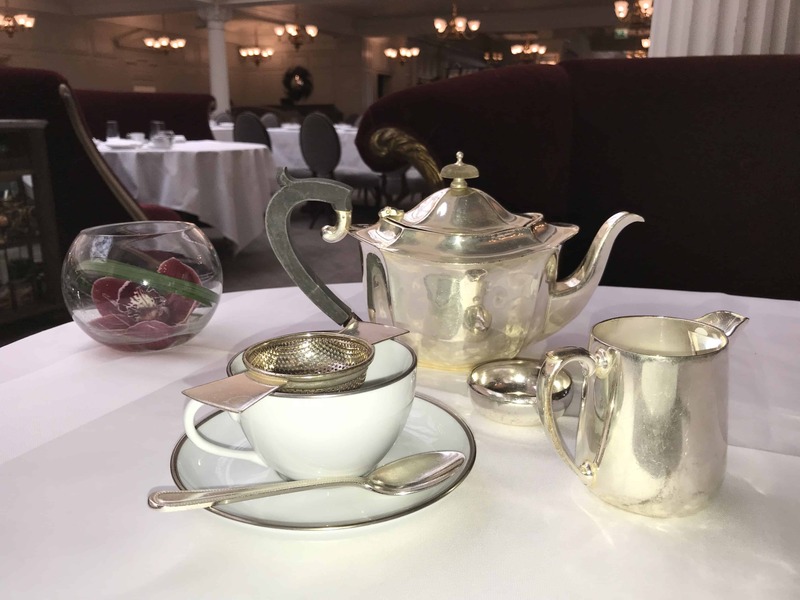 It is the iconic afternoon tea for a reason, actually many reasons – the service, the décor, the location and of course the tea experience itself. 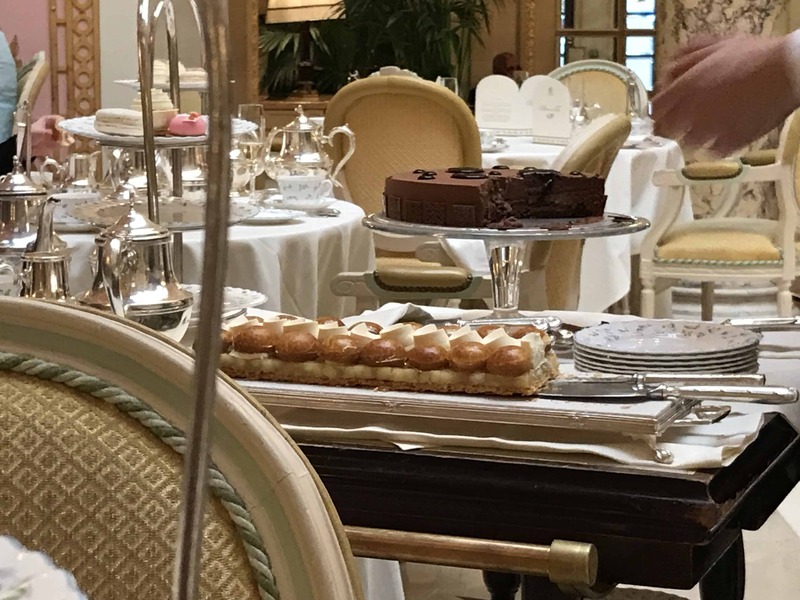 Any tea lover should experience tea at The Ritz at least once. For me, this was a second visit, the first being in 2001 for my mother’s 81st birthday. After serving my tea of choice, the impeccably attired server presented my sweet and savory platters. My favorite from the savory platter was the cucumber with cream cheese, dill and chives on granary bread. However, each choice was fresh and flavorful. 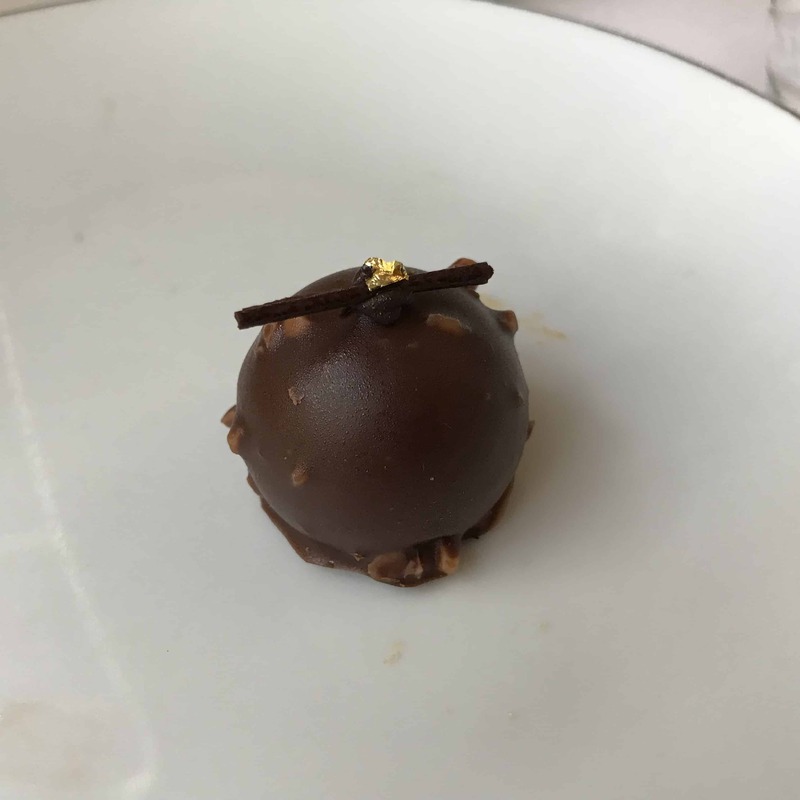 What can I way about the sweets? Exquisite and delicious. 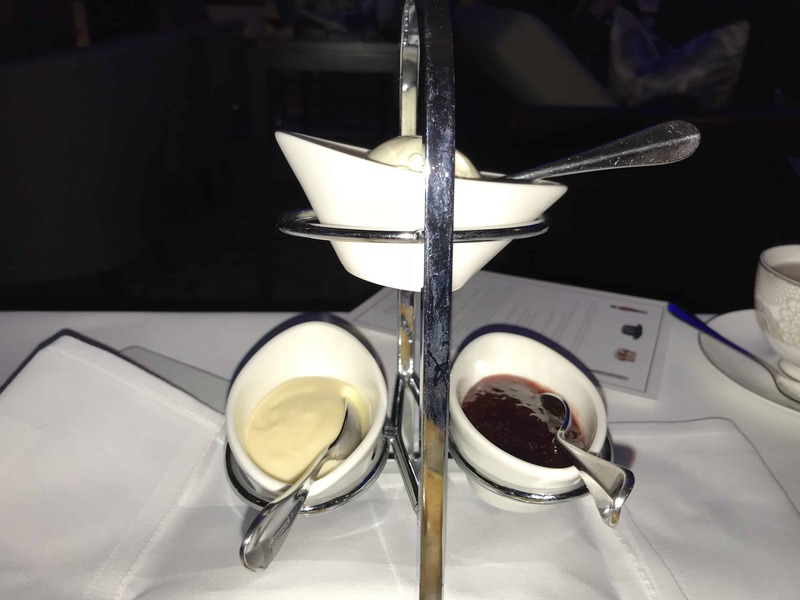 Warm scones served with Cornish clotted cream and strawberry preserves followed the sweets. And, after replying no thank you I cannot eat another bite to an offer to refill my platters, a server came by offering two full-sized desserts of which you could choose one or both! It would be impolite to not taste at least one of the offerings. 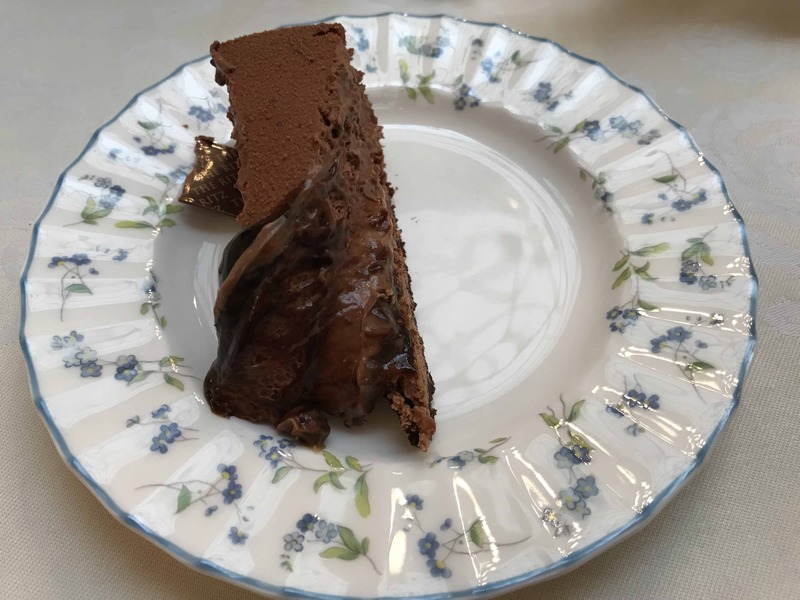 As I was savoring my chocolate cake (I only ate about a third) a few tables away the waiters were serving a celebration cake as a finale to the afternoon tea while singing Happy Birthday. With tears in my eyes remembering my mother’s birthday celebration I left The Ritz and turned left as I exited. 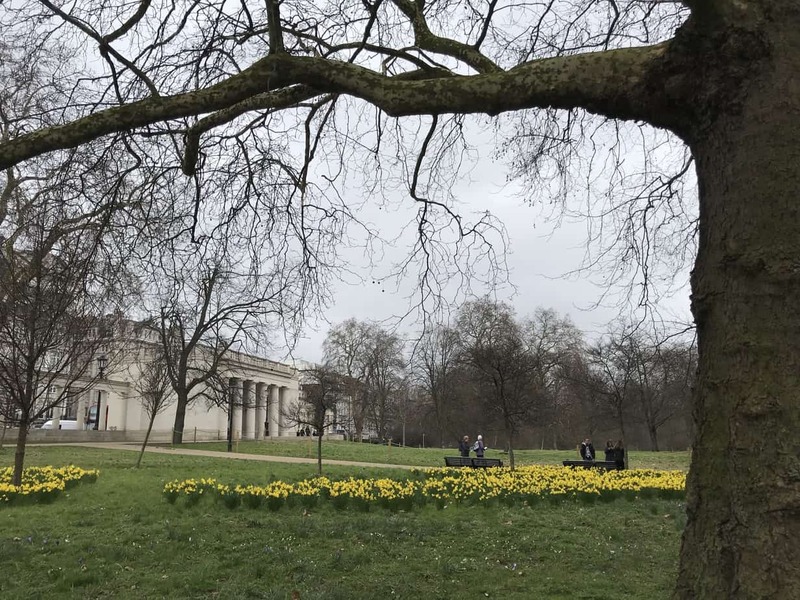 Just steps away was the lovely Green Park with yellow seas of daffodils. A stroll through the park leading to Buckingham Palace was the ideal finish to my afternoon at The Ritz. 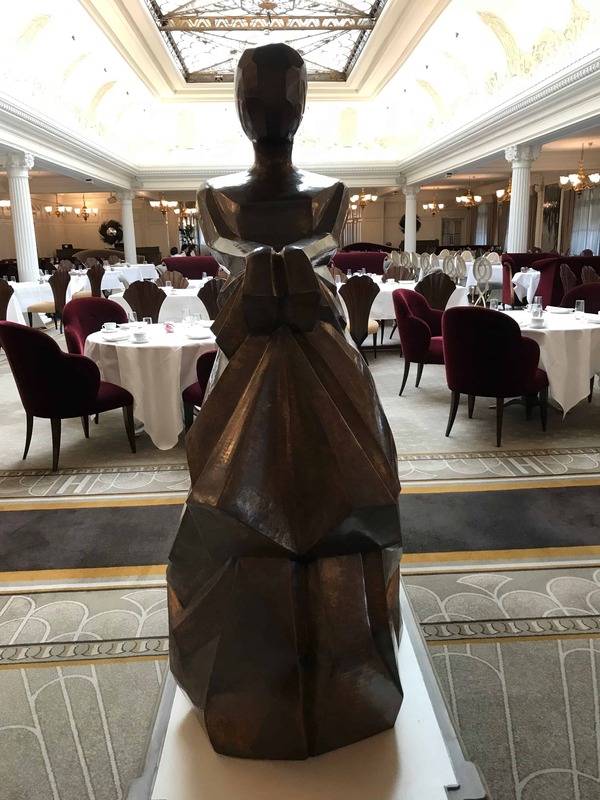 Afternoon Tea is served daily at The Ritz at 11.30am, 1.30pm, 3.30pm, 5.30pm, and 7.30pm. Prices from £57 for adults and from £35 for children. Conrad St James served as home base for my five-day tea indulgence. 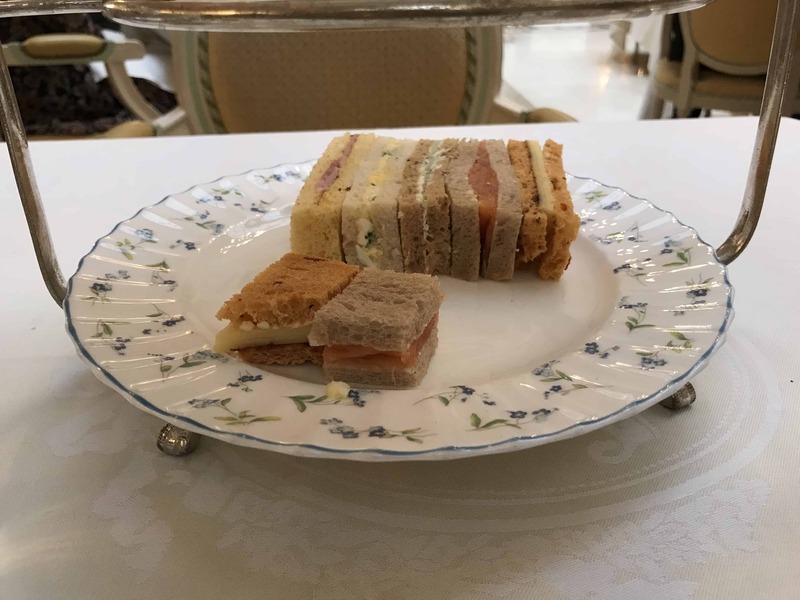 I found their traditional afternoon tea served in Emmeline’s Lounge just off of the lobby an unexpected surprise. 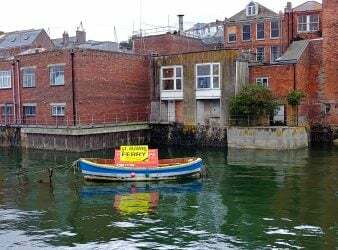 Although a well-located hotel with superb service, it would not have been my first thought for tea. A London based friend joined me for a late afternoon/early evening tea. It proved the perfect choice for a reunion. Emmeline’s décor is that of a large sitting room with comfortable couches, chairs and low tables. The atmosphere is cozy and quiet allowing two dear friends who had not seen each other in over ten years to take our time talking, sipping and eating. 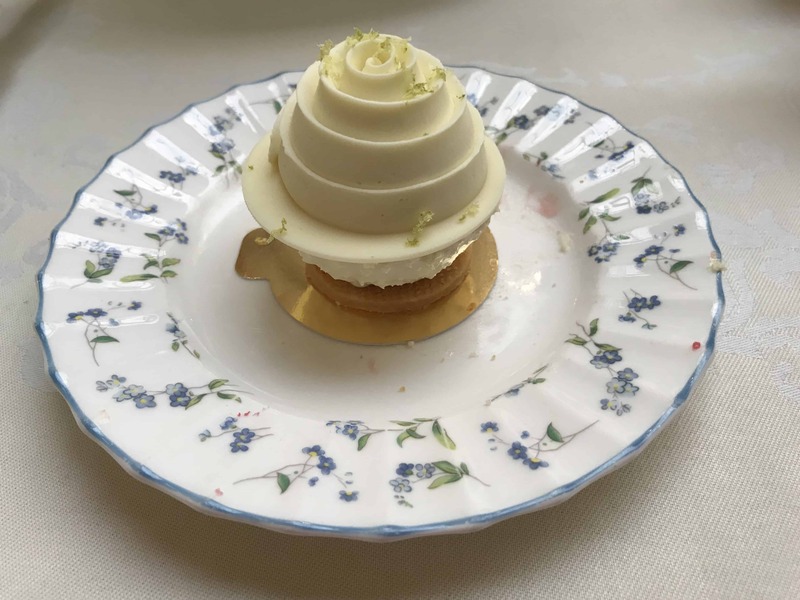 Emmeline’s tea menu provided the best balance between savory and sweet of my five days. 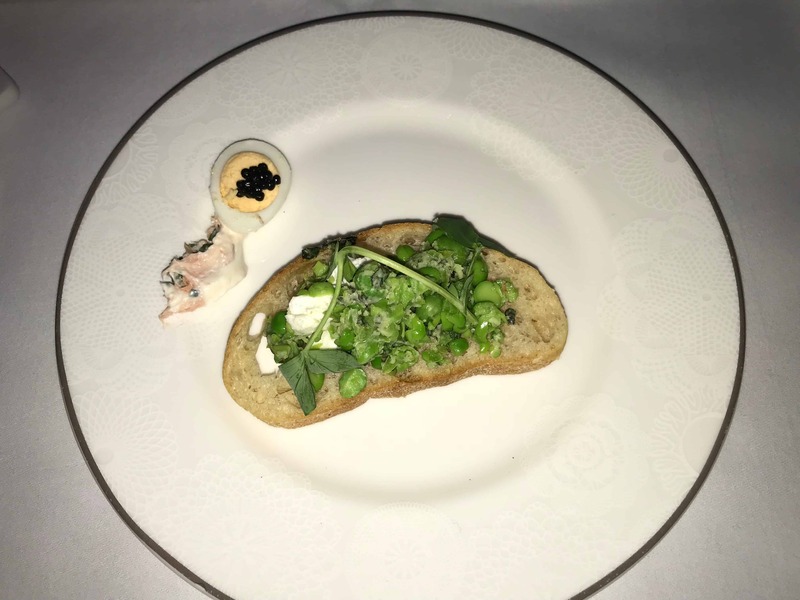 The savory course started with garden pea, mint and goat’s cheese crostini, followed by hot smoked salmon, lemon and chives. 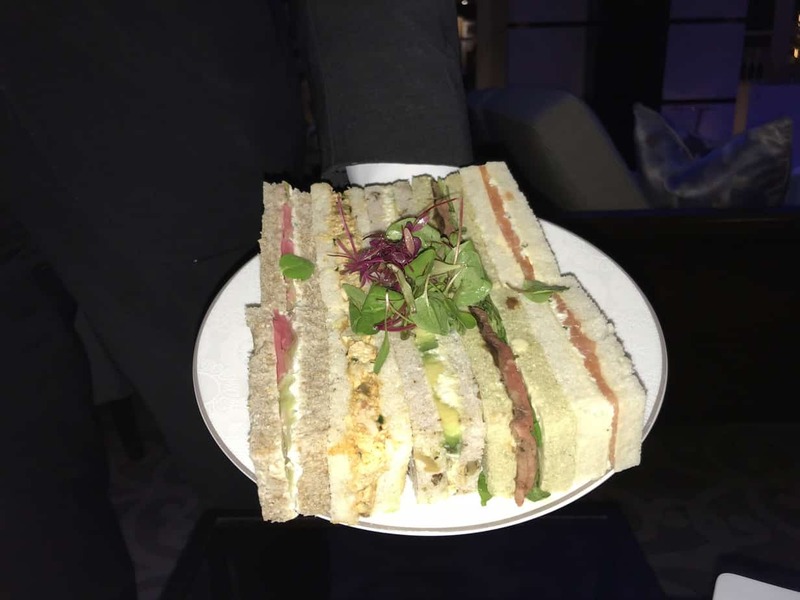 The balance of flavors combined with fresh ingredients resulted in a delectable tray of sandwiches. 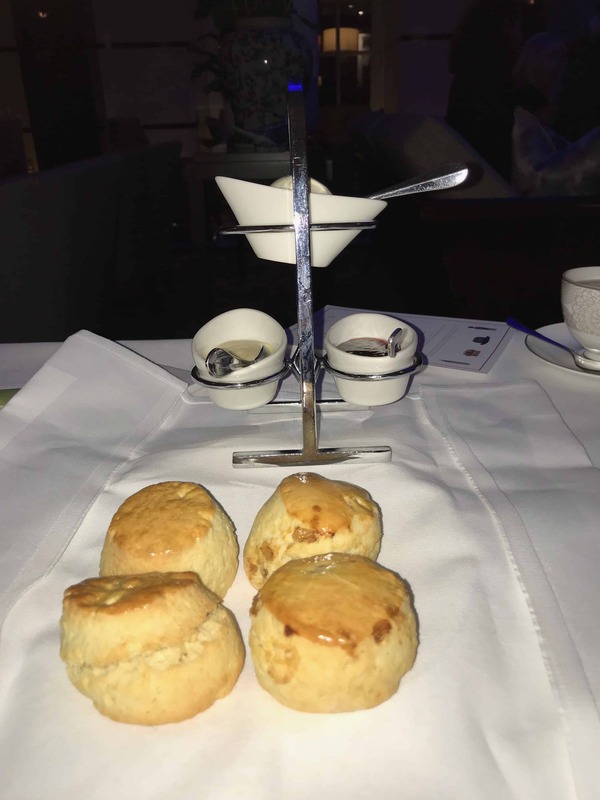 Afternoon tea would not be complete without scones, and so our tea concluded with homemade plain and fruit scones served with lemon curd, strawberry compote and Devonshire clotted cream. 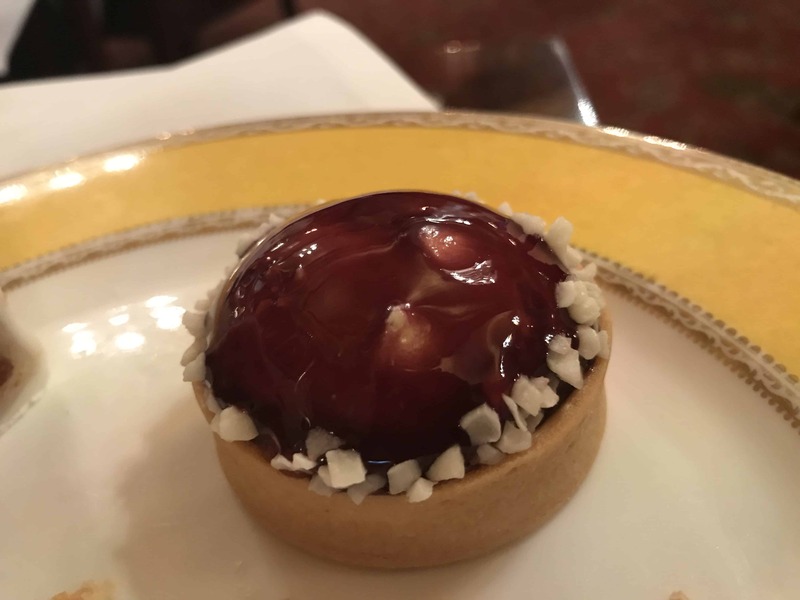 I recommend Emmeline’s at Conrad St James for a late afternoon tea after a day of business meetings, getting together with a friend for a leisurely chat or to conclude a quintessential London visitor’s day spent in the Westminster area. 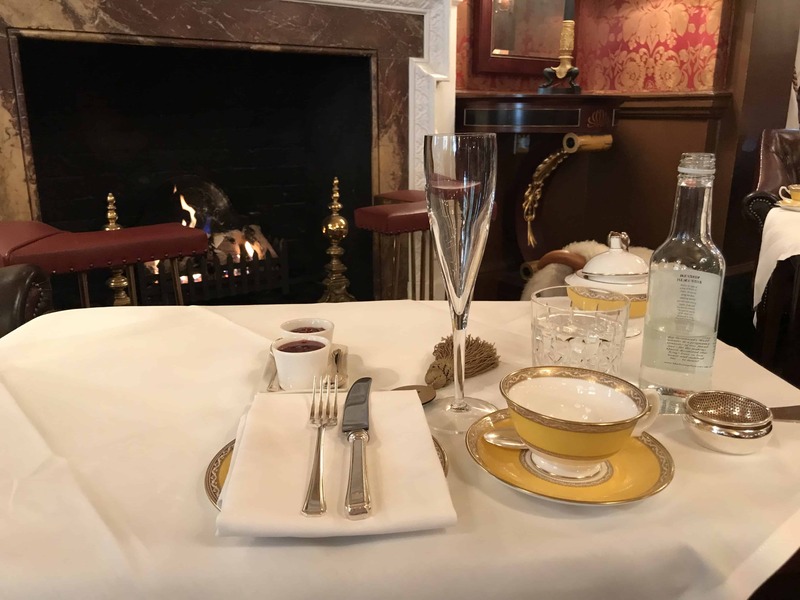 Afternoon Tea is served daily at Emmeline’s from 1:30 p.m. to 6:00 p.m., Traditional Afternoon Tea – £35 per person, Champagne Afternoon Tea – £45 per person. 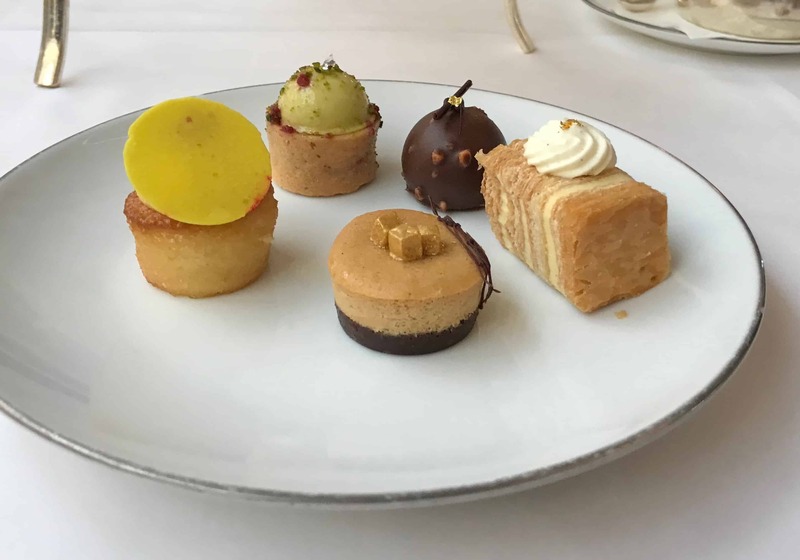 Anyone visiting Harrods’ one million plus square feet of shopping space spread over five acres will appreciate a break for afternoon tea in Harrods Georgian Room. The atmosphere reminds me more of lunching at the department stores of the ’50s and ‘60s than an afternoon tea setting. Albeit, an elegant department store restaurant. 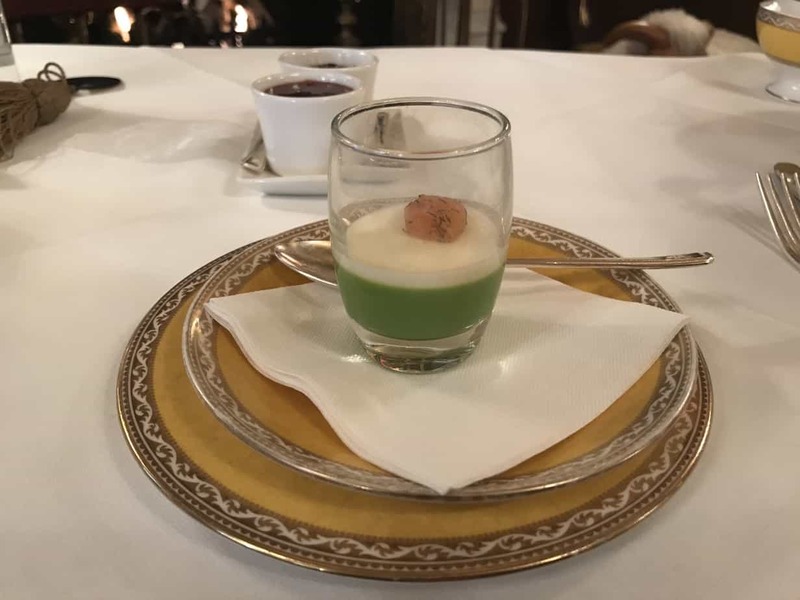 There is no skimping on the food in this tea service. I especially liked the addition of the broccoli tart to the savory course, small with crispy crust and intense broccoli flavor. 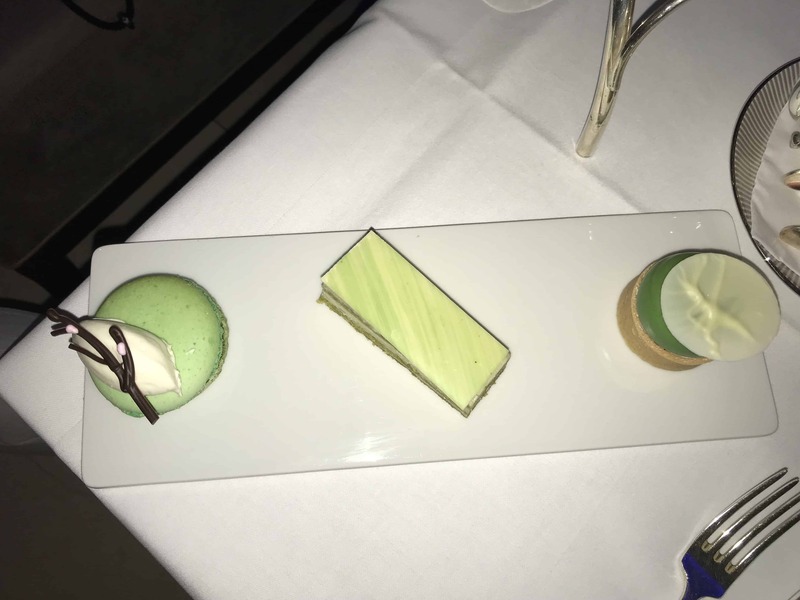 The sweet course served up elegant bites that tasted as delectable as they looked. I found the scones to be a bit under baked making them doughy in the center. 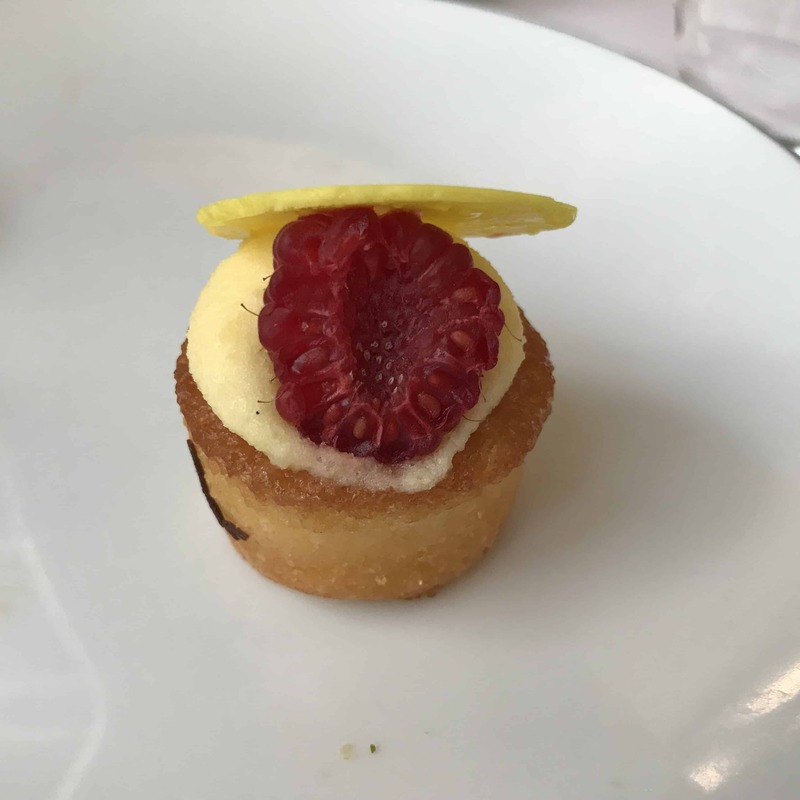 However, in addition to clotted cream, they were served with an intriguing accompaniment of rose petal jelly, raspberry jam, and lemon curd. This indulgent array of food concluded with a jar of Harrods Trifle. I only took a small bite to taste. It was good, but seemed unnecessary amid all of the luscious sweets that had preceded it. 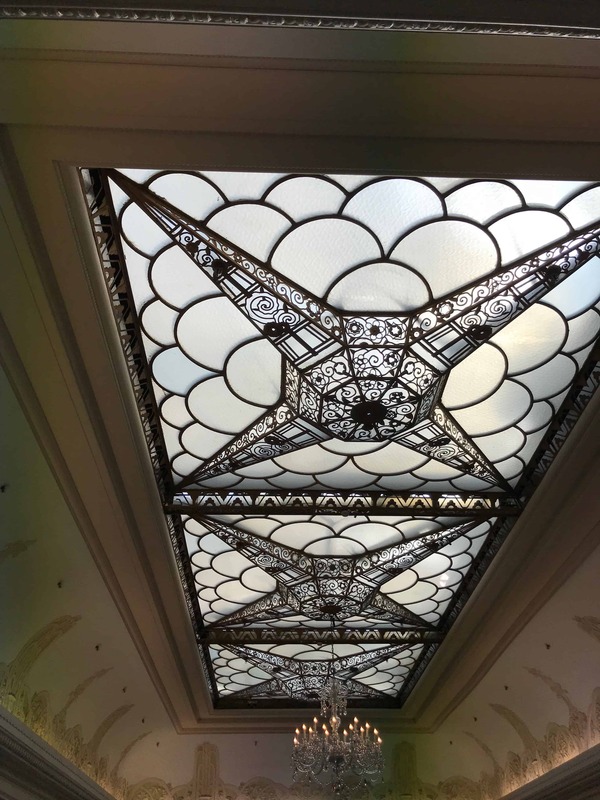 If you have not been before, Harrods is an iconic part of London’s history that is worth a visit. While there, tea in the Georgian Room is a pleasant break from investigating the wares on display in Harrods five acres. Afternoon Tea is also available in The Tea Room. 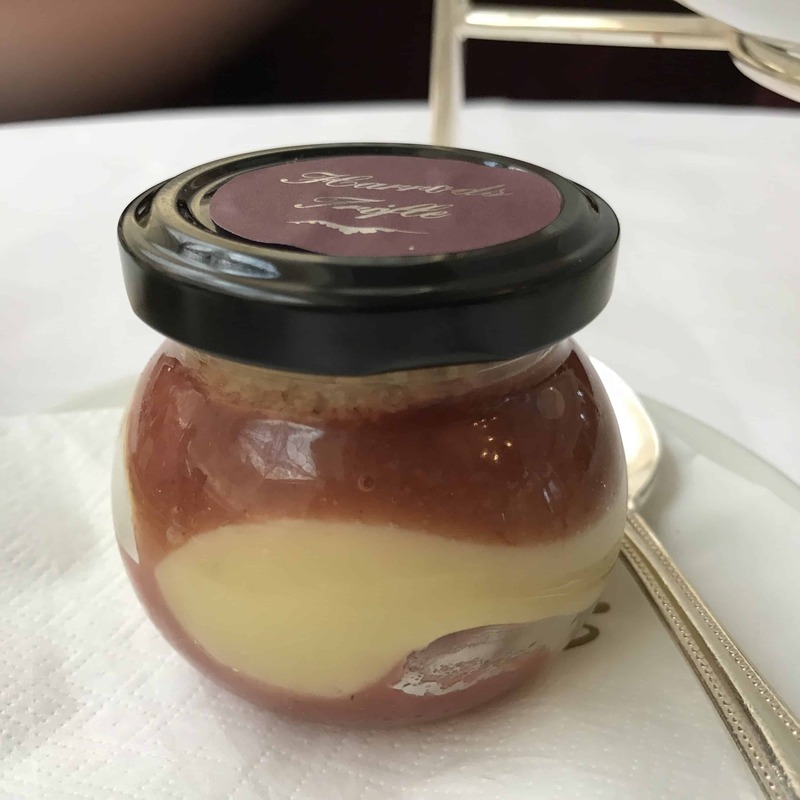 They have been serving tea at The Goring Hotel for over a century and are the holder of The British Tea Guild Council’s Top London Afternoon Tea Award and The Award of Excellence. 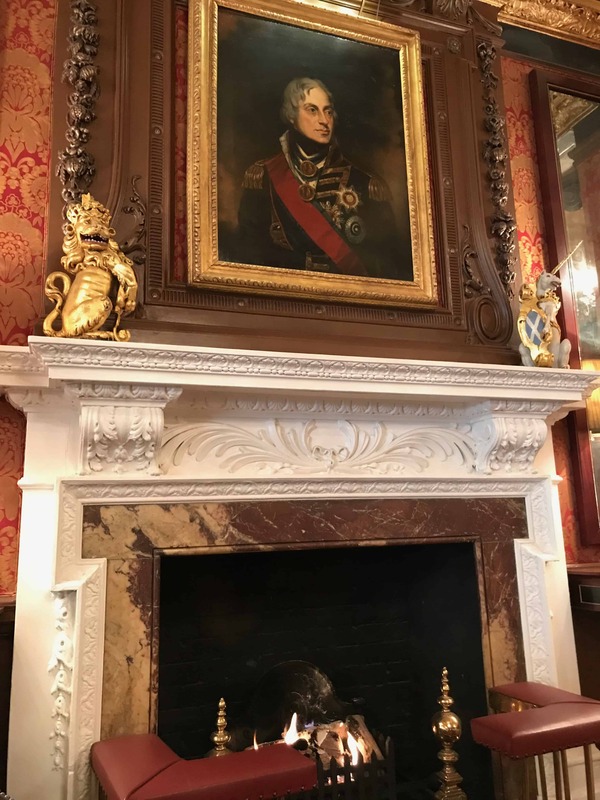 This hotel tucked away on a side street not far from Buckingham Palace embodies all of my notions of London’s historic grandeur and stateliness. 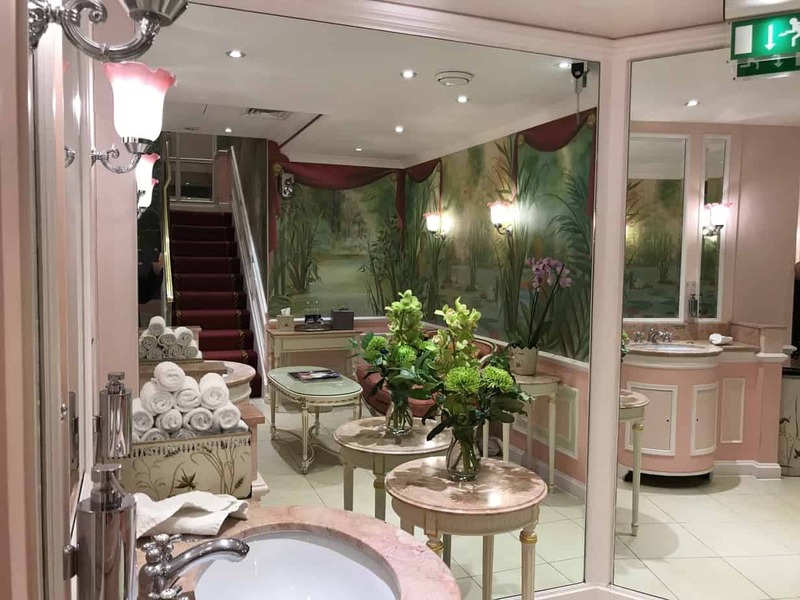 Housed in what was the Goring family home, the hotel is elegant and at the same time inviting and comfortable. 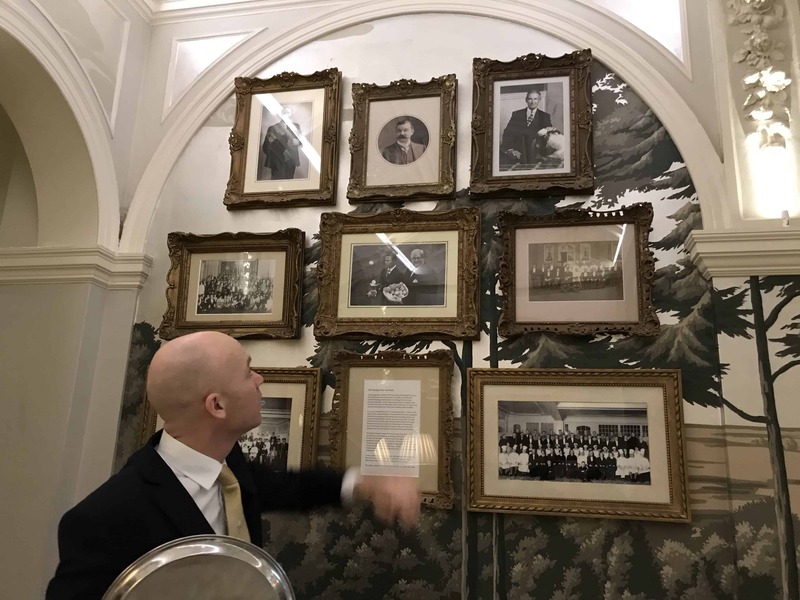 The Goring provided the most extensive choices for decaffeinated tea of the week. Including several choices for decaffeinated black tea which can be difficult to find. 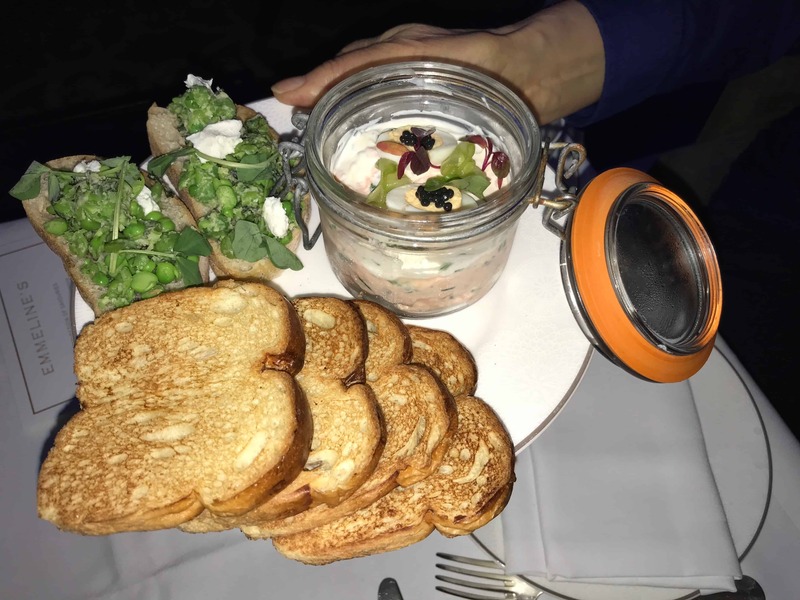 Tea service started with an Amuse Bouche of Pea Mousse with Crème Fraiche topped with smoked salmon with dill. Next came the tiered tea service. However, the sweets overshadowed all else. 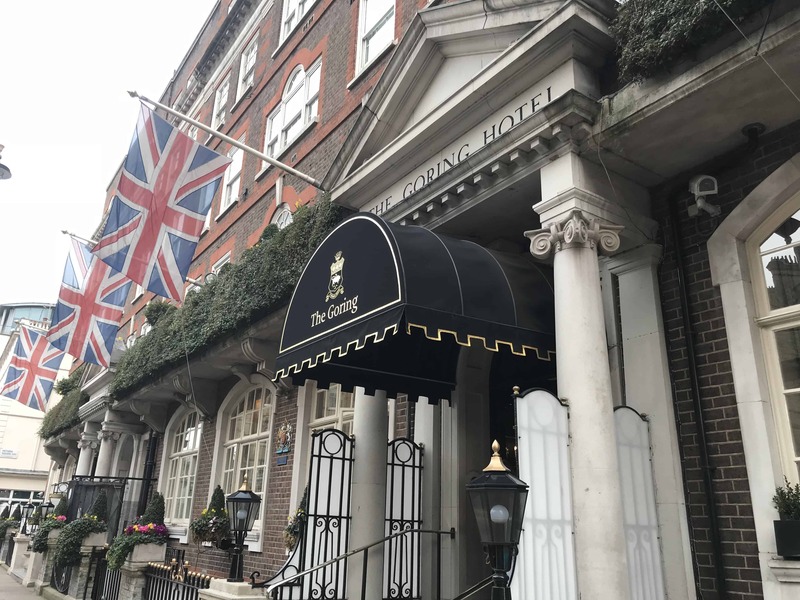 My new fantasy, a two night stay at The Goring Hotel with a repeat of their outstanding Afternoon Tea. 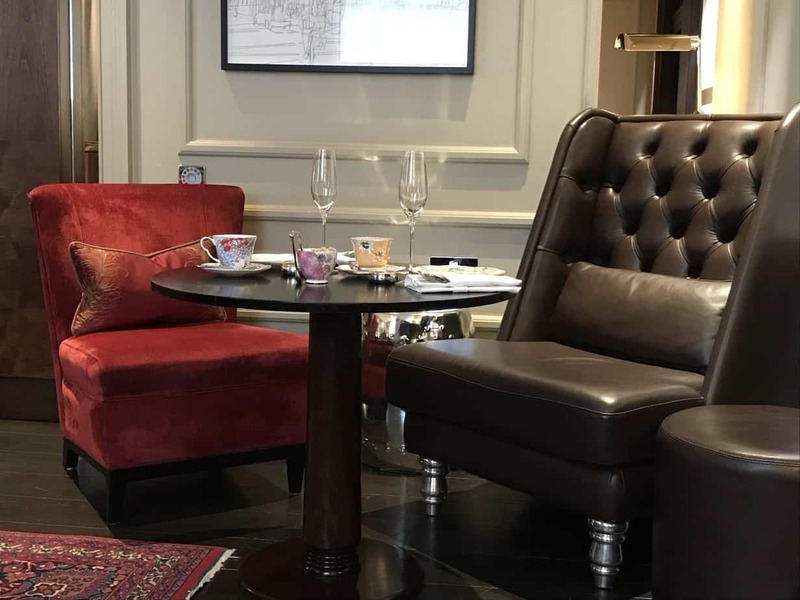 Afternoon Tea is served daily in the Bar & Lounge between 3.00pm – 4.00pm and also in The Dining Room on Saturdays between 1.00pm – 4.00pm. You can also request a gluten-free tea in advance. Afternoon Tea – from £49.00, Afternoon Tea with Bollinger – from £59.00, Afternoon Tea with Bollinger Rose- from £69.00. 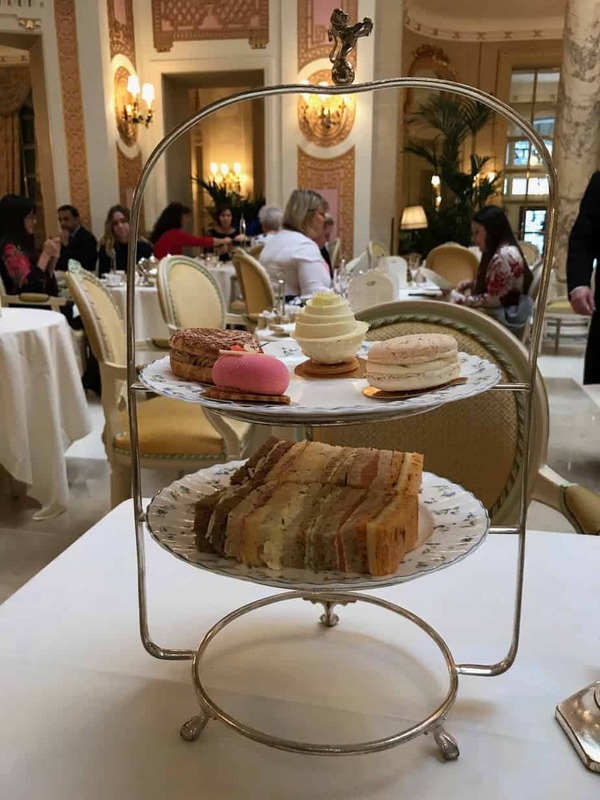 I left London pretty certain that I would never crave another Afternoon Tea. 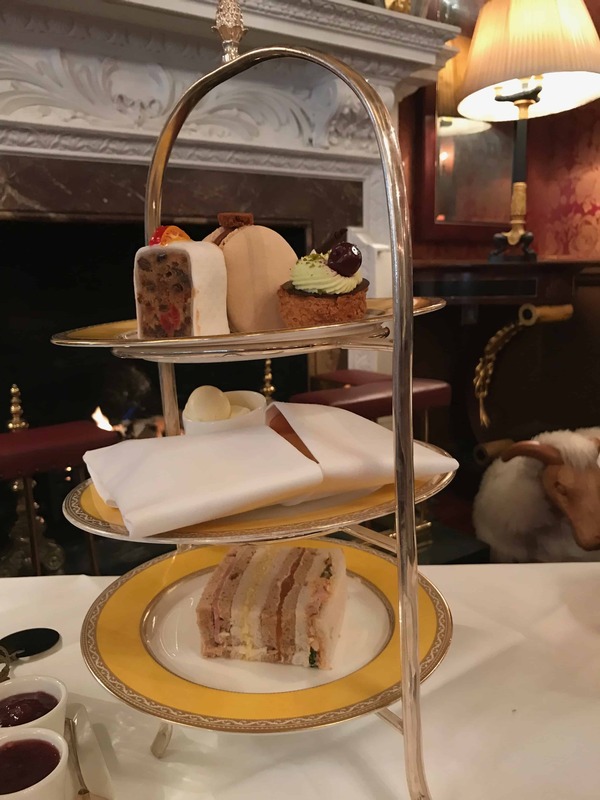 Of course, within two weeks of my departure I was contemplating which tea I would revisit during my next London stay and what new Afternoon Tea experience to try next!